I got an A-HA moment when I read Tangled Noodle 's latest post Eu Sau Brasilipino. She mentioned that she can't find calamansi in Minneapolis and here I was having a grand time having a bilao (a woven tray) of this uniquely Southeast Asian citrus fruit. I 'm sure you could find a lot of information about this fruit online. 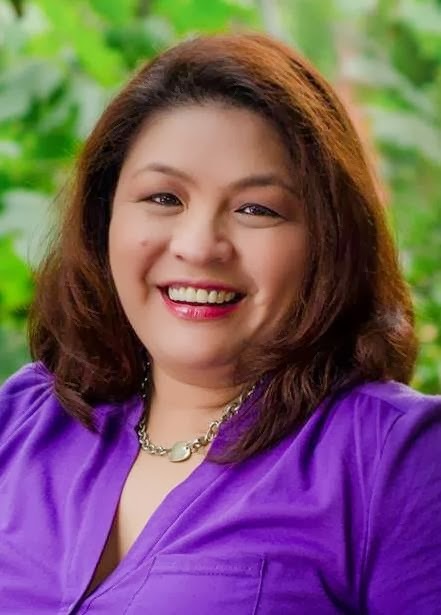 But for Filipinos, we use calamansi in a variety of ways, including: to make a refreshing juice that multi-level marketers can only dream of, as a condiment to mix with soy sauce and sili (fresh peppers) - especially for inihaw na pusit (grilled squid) and barbecue na liempo (grilled pork belly), or to marinate meats and seafood. It's really hard for me to find calamansi here in the US, except when I moved here to SoCal. Yesterday, I called up my friend Angie to ask her how she was doing. I met Angie in a most unusual way. I interviewed her for a position and the interview turned into a long conversation, and we became instant friends. Although we were not able to work together, our friendship continued. She has become my confidant, my cheer leader and she keeps me grounded spiritually. I haven't seen nor talked to her in awhile, so I thought of giving her a call. I was surprised at how much she was giving me. I've never seen this much calamansi since I was in the Philippines. What will I do wth all these calamansi? I thought about making calamansi (in-lieu of lemon) squares, calamansi juice, add calamansi to almost everything... but when I read Tangled Noodles' post, I changed my mind...I'll give it away to someone I've connected with, hoping to introduce this citrus in their cooking, and in the hopes of starting a friendship similar to what I have developed with Angie. Tangled Noodle also mentioned that a lot of you are curious about this citrus, so I thought of sharing Angie's harvest with you. Please leave a comment on how you intend to use the calamansi. 2. Tweet about this giveaway. You could tweet as often as you want and enter your link everytime you do so. Plus one entry for each tweet. 3. Become a follower on Twitter. Plus one entry (for new followers only). This giveaway is open to US residents only (sorry!). Entries will be no longer be accepted after 12pm PST on Monday, March 8. I will use http://www.random.org/ to pick a winner... Good luck everyone! 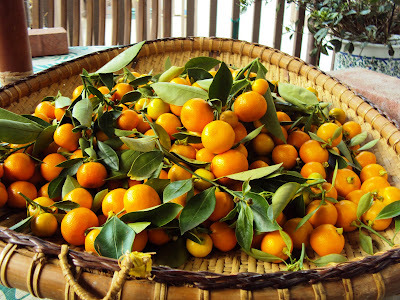 These calamansi are beautiful! There's nothing to compare with their flavor, so I am indeed feeling deprived not being able to find the fresh fruit. Whoever ends up with this bounty will be in for a delightful treat!! 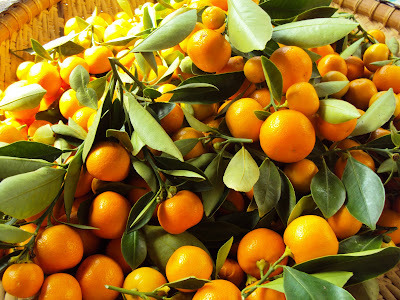 Whoa, look at all those calamansi! I haven't seen so much since Philippines. I just got a tree after a long search & it's full of flowers right now. Can't wait for them to become fruits--I am getting impatient! haha. I was thinking of finding a way to turn this into a sorbet...hmmm. Maybe a dish of half sorbet, and half homemade coconut ice cream. Kinda like a 50/50 bar or an orange-dream-machine. Okay, Malou. Found this recipe for you. 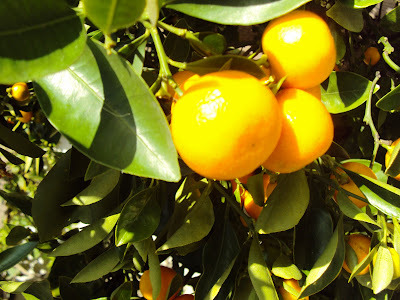 It's for a calamondin (aka calamansi) pie -- with an oatmeal cookie crust! Wow....so much! They look so fresh! I really miss calamansi drink. You can make them into sweet calamansi pickles. It's fabulous! Cut into 2, remove the seeds and cook like what I did for kumquats at http://www.keeplearningkeepsmiling.com/2009/12/14/cooking-kumquats/ Oh, I wish I can have the whole tray! beautiful bounty... we love to make calamsi drinks like mojitos and then candy the left overs for sides with meat dishes. Whoa! How cool. I have never heard of this fruit before. It's like a lemon you say? I would definitely use it in calamnsi bars (like lemon bars...but not). I have never heard of calamansi but they are beautiful!! I have no clue as to how to use these...probably in a drink or dessert :) Beautiful Malou! I can't count how many times I've been told "oh, we use calamansi" by Filipino friends when I'm cooking a dish from there. I wouldn't kill for calamansi but I probably cold do grave bodily harm in that quest. I'm hoping beyond hope to win these!!!! I love that you're sharing the calamansi love with the world! :) We used to get shipments of the fresh stuff from family friends in San Diego. So jealous that you can grow it there. I'd use them to make all of those Filipino dishes I am dying to make without having to fake calamansi. And calamansi cocktails! We have this in Malaysia, especially more during Chinese New Year, we call them 'Kat', very auspicious, meaning good, prosperity. Normally they come in pots and we bring into our homes as a decor and also to bring forth good luck, whatever good tidings you can think of! These calamansi look so luscious. I've been planning to bake a lemon cake. I will use calamansi instead of lemon. The only time I see calamansi is when I go to the Asian store but they don't always have them in stock. Thanks for giving this away to the lucky person! I miss calamansi! SO darn hard to find it here in Australia in the shops unless you know someone who has a plant heehee! I've never tasted calamsi. I would probably start by squeezing it onto a salad or fish. I'm intrigued. Great giveaway! Oops! I missed it! I will be dreaming of it! 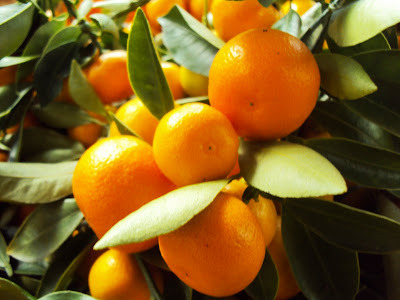 I ADORE citrus of all kinds! OMG! 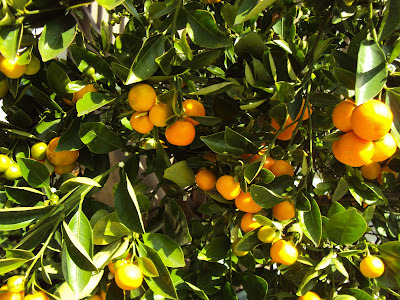 Look at how nice your calamansi grew! How I wish SF weather is like San Diego so I can grow things in my backyard. I'm trying to grow kumquats and they're not doing so well. It's been too cold and stormy for the past 3 months. I just returned from a trip to El Segundo, just south of LAX airport to visit my daughter. They had Half gallons of calamansi juice in their refrigerator , that they buy at Whole Foods, on Supulvada Blvd. just south of LAX. I have never tasted any thing SOOOOOO Good. I live in Indiana and Alas, we are doomed. Cant find Calamansi lime juice anywhere. those calamansi are beautiful!!!! I was googling for pictures of calamnsi went through hundreds and yours was the best one. I have a blog and was writing about calamansi tea, I hope you don't mind that I use your picture (I will credit it to you and link it back to your page) . Please let me know if this is a problem. Thank you again for sharing your pictures! !